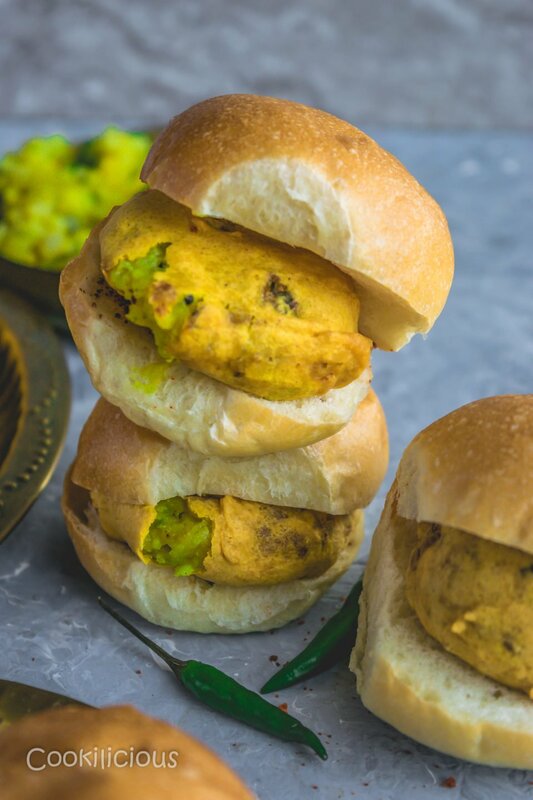 Known as the Indian Burger, Vada Pav is a popular street food. 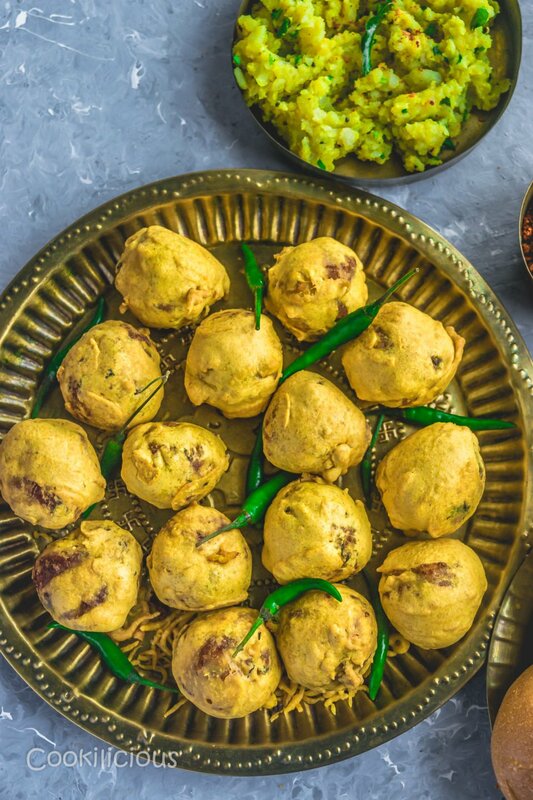 Spiced potato dumplings are dipped in besan batter, fried & then served with pav as a snack. It will always be Bombay for me. Mumbai doesn’t connect with me as much as Bombay does. Well in all sense, I am one true Bombayite!! If you have obviously been to Bombay or lived there, you would understand this emotion. It’s not just a city, it’s an honest feeling. Even after moving miles away from it, I cannot take it out of me nor do I wish to. Today I miss Bombay for one too many reasons. It not just gave me my identity, kept me company in my lonely days but also gave me a lifetime of memories. Let’s not forget the vast variety of food that’s made everyday in this city. Be it in homes of the cosmopolitan crowd or the streets of every nook and corner. While there are many dishes that emerge on the streets of Bombay, there is only one that stands out of them all. 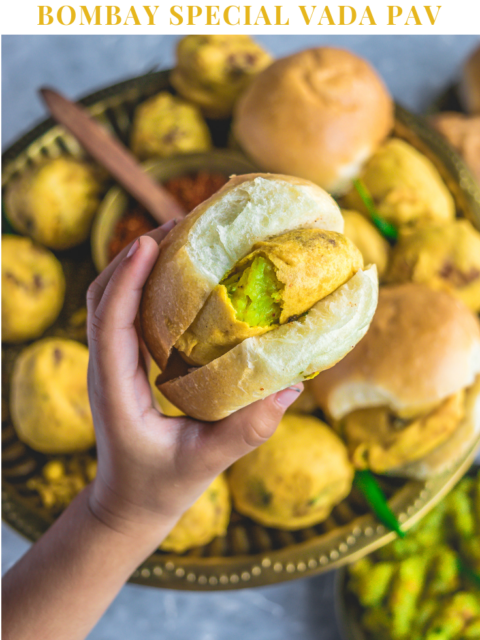 Be it a resident or a tourist, not one of them would have missed tasting this extremely famous street food called Vada pav. It looks like an easy dish to make, I mean, after all, it’s just a potato vada sandwiched between a pav. Actually, it’s quite a process to make this dish a success for me. 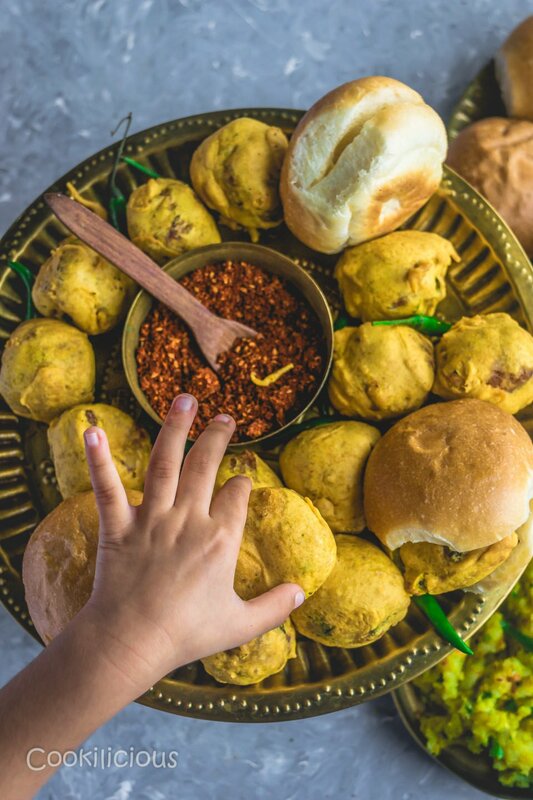 Firstly, I am away from Bombay, missing our home, missing this delicacy, I have to emotionally prepare myself to make this and also adjust to the fact that I will not be able to simply order it from the local food stall near our house. 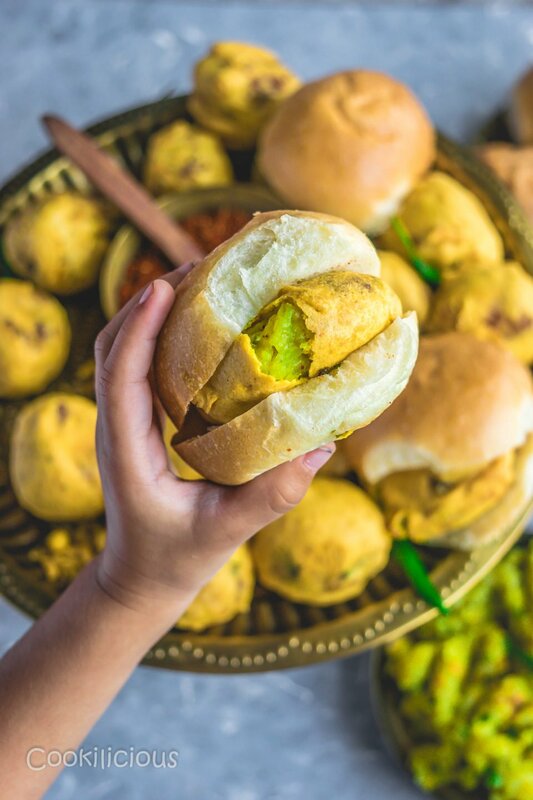 Next comes the feeling of nostalgia which takes me back to the days when dad used to get hot vada pav on his way home from work for all of us, no evening walks with friends were complete without gorging onto atleast two vada pav if not three or just enjoying it as part of your dinner! You know, we had a local vendor near our house, who made the most awesome vada pav. We knew him by his first name and since we were his regulars, we had an account with him and he even gave us free home delivery! So today this post is dedicated to him. 🙂 My husband loves it too, in fact that is the first thing we have when we land in Bombay. Well, I can go on and on about my love for vada pav to an extent that this may sound like an essay on it. So let me shut up and straight away go to method of making it. That is why you are here after all! Just one more thing – since I had never needed to make them in Bombay, I never really learnt to make it back then. Now that we are away from our hometown and miss this famous delicacy, I learnt to make it. There is a funny thing going on between KR and my girlfriends. Whenever anyone of them visit us from Bombay, they make vada pav for him. This time too, it was no different. One of my friend was visiting us along with her family. She insisted that she cook something for us and knowing KR’s fixation with vada pav, she decided to make that for us. Her recipe is little different to what I normally make and that is why I chose to share her recipe with you today. We loved it.
. This step is essential as it will make the vada crispy. 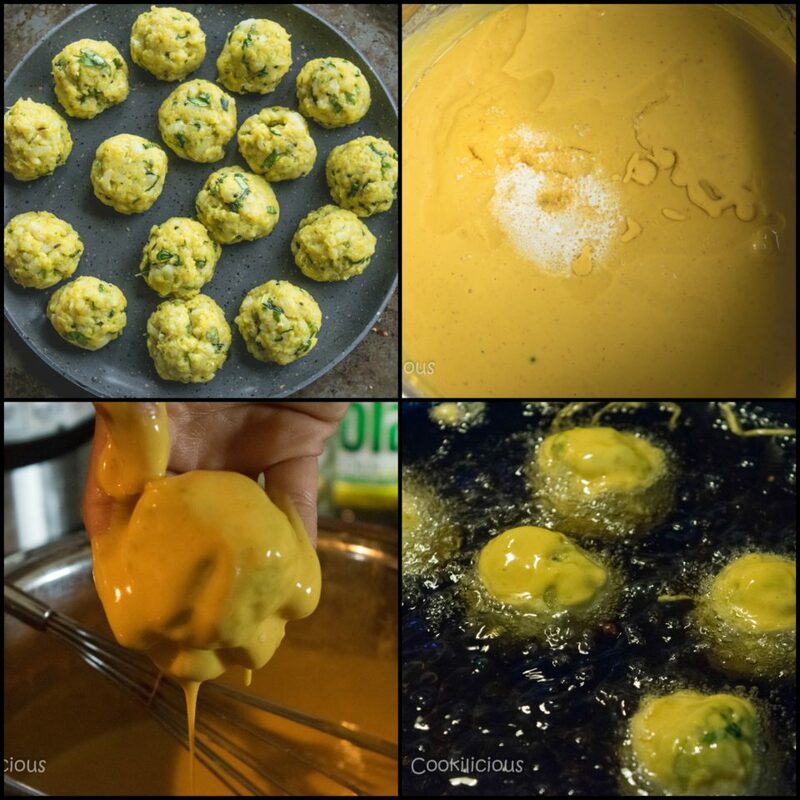 Dip/coat the potato balls in the prepared besan batter and carefully toss them into the frying pan. Deep fry till golden brown. Remember to keep the flame on medium. Carefully take out the fried vadas onto a paper towel to soak off the excess oil. Fry the remaining vadas the same way. Now its time to assemble the vada pav. Pav is an Indian bread that is easily available in India. But if you are in US, you can use water rolls as they come the closest to the desi pav. Take a water roll/pav, slit it halfway in the middle, smear it with sweet tamarind chutney and spicy green chutney. Then sprinkle dry garlic chutney and place a vada in between and close the bread. Enjoy them hot, anytime of the day! You can also serve them with fried green chillies on the side. 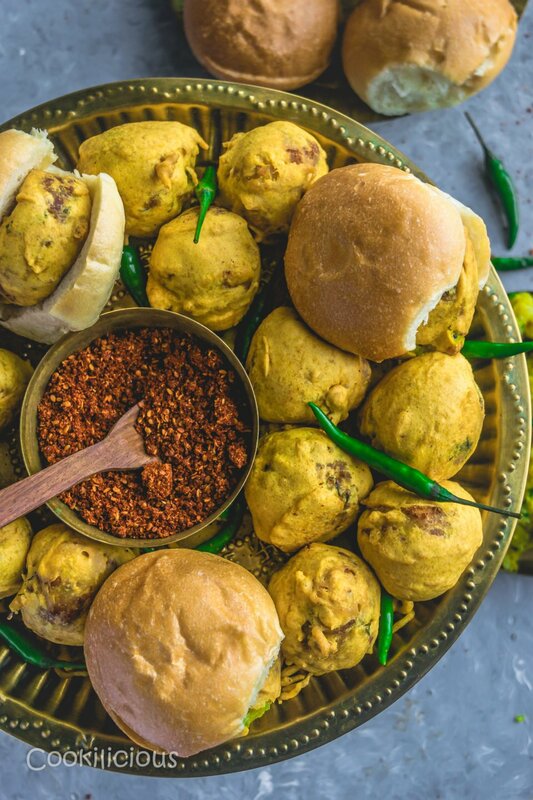 Devour these Bombay special Vada Pav today and worry about the calories later. Holidays are the best time to enjoy such delicious snacks. First step is to make the potato stuffing. Boil and peel the potatoes. Mash them using a masher. You can even grate them. Transfer this to a bowl. Make a paste of ginger, garlic, green chillies and cilantro. Add this to the bowl. Give a tadka of mustard seeds, cumin seeds and curry leaves and pour this over the potato mix. Then add spice powders like turmeric powder, garam masala, salt and chopped cilantro. Give it all a good mix and using your palms, shape them as medium-sized balls. Next, heat oil in a frying pan. Now time to prepare the chickpea batter. 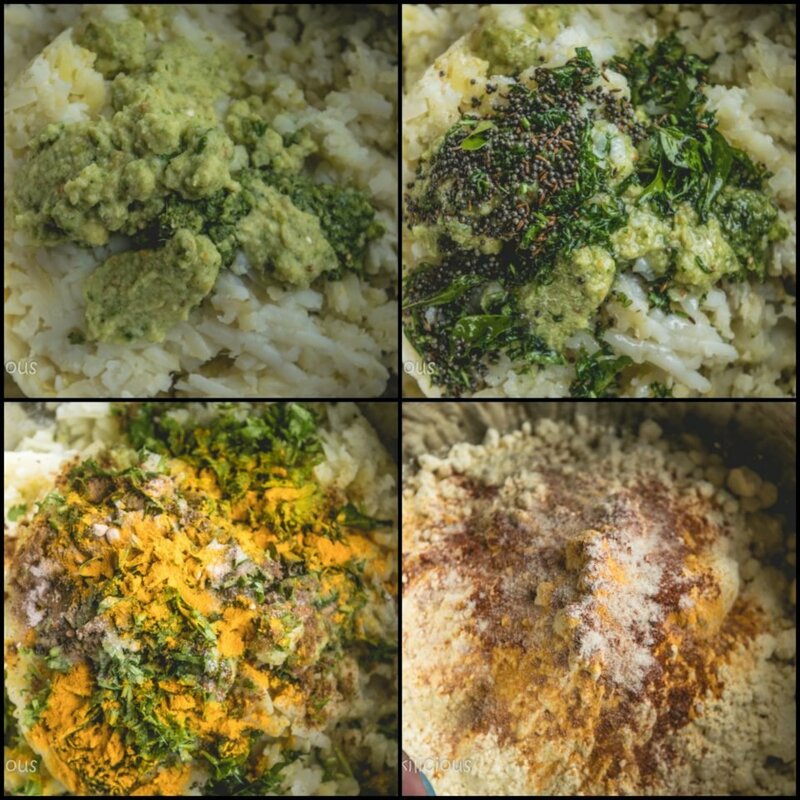 In another bowl, add chickpea flour/besan, chilly powder, turmeric powder, coriander cumin powder, garam masala and salt. Add water gradually and mix using a whisk. The consistency of the batter should neither be too thick nor too thin. It should have a thick flowing consistency. Once the oil is hot enough, add 1-2 tbsp of hot oil to the prepared batter along with fruit salt/eno. This step is essential as it will make the vada crispy. Dip/coat the potato balls in the prepared besan batter and carefully toss them into the frying pan. Deep fry till golden brown. Remember to keep the flame on medium. Carefully take out the fried vadas onto a paper towel to soak off the excess oil. Fry the remaining vadas the same way. Now its time to assemble the vada pav. Pav is an Indian bread that is easily available in India. But if you are in US, you can use water rolls as they come the closest to the desi pav. Take a water roll/pav, slit it halfway in the middle, smear it with sweet tamarind chutney and spicy green chutney. Then sprinkle dry garlic chutney and place a vada in between and close the bread. Enjoy them hot, anytime of the day! Potatoes are the most used vegetable in many kitchens and here are some fun recipes to create using it – Instant Pot Spicy Potato Mint Pulav, Potato Chilly Garlic Masala Toast, Healthy Green Amaranth Potato Idli | Rajgiri Potato Idli, Sautéed Potatoes With Spinach | Aloo Palak Sabzi, Aloo/Potato Roganjosh, Andhra Style Green Beans & Potato Curry, South Indian Spicy Potato Fry Curry, Potato Paneer Kathi Roll/Wrap, Green Beans Potato Gravy, Hummus Flavored Mashed Potato Waffles and Gluten Free Mint Flavored Potato Bajra Pancake.